Just installed this yesterday and now app will launch and not run (failed repeatedly. Running Speccy 1.30.730 which ran fine on Win 10 Anniversary edition (16??). Just tried it again and it finally launched. Have sent several error reports - did something change here? Installed which one yesterday, the Win10 update or Speccy. If you didn't just install Speccy try to reinstall it again. My Windows 10 (32bit) 1703 Creators Update PC crashes completely and reproducible when starting Speccy, latest version. Error Code is PAGE_FAULT_IN_NONPAGED_AREA, reason: cpuz140_x32.sys. See photo attached. Same issue here. Speccy 1.30.730 worked fine on 32-bit and 64-bit versions of Windows running the latest Anniversary Update (1607). Updated machines to latest Creators Update (1703) and now 32-bit versions of Windows crash when Speccy is launched. 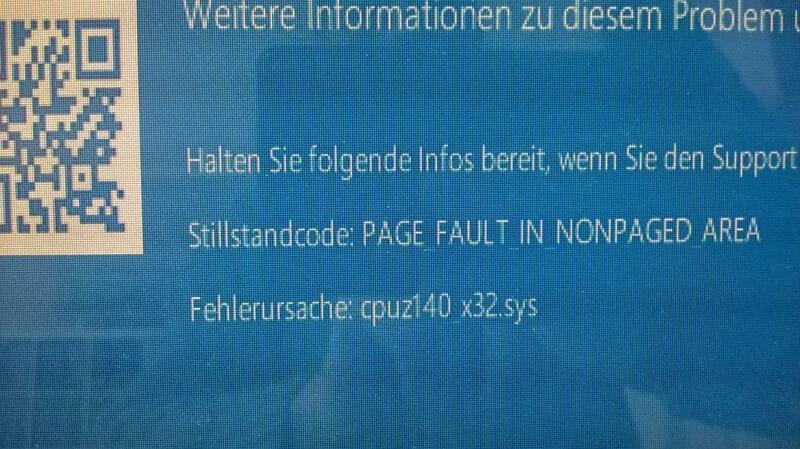 Same error as above: PAGE_FAULT_IN_NONPAGED_AREA, reason: cpuz140_x32.sys. Speccy launches and runs fine on 64-bit versions of Windows that use cpuz140_x64.sys in C:\Users\Admin\AppData\Local\Temp\cpuz140. I have tried reinstalling Speccy on the 32-bit machines. It made no difference. FYI, the latest version of CPU-Z (1.79) from CPUID, works fine on 32-bit Windows running the Creators Update. It uses cpuz143_x32.sys in C:\Users\Admin\AppData\Local\Temp\cpuz143. Win 10 update was installed the day before I reported this. Speccy was the latest version and was updated to version 1.30.730 before this incident. I tried a Speccy uninstall, down load from the Piriform website, and reinstall with no changes. This is Win 10 Home 64bit on a Dell i5555 laptop with a 256 GB SSD and 16 GB RAM. Speccy will launch and try to run. It then returns an error form noting that the app unexpectedly terminated and closed. It gives me 5 minutes to complete and return the form which I have completed and returned to Piriform at least four (4) times. Since this is the free edition, I did not expect a response. They are aware of the issue. If we get any news, we will be sure to let everyone know. I have the same BSOD 4 times in a row as you on Speccy 1.30.730 and Win 10 Creator Update (1703) 32 bit. It is fine on Win 10 Creator Update (1703) 64 bit. I hope that this will get fixed soon. I track the "Hotfixes" of windows KB updates in text which has helped protect me from malware. Windows created 4 minidump files. It still continiue the problem with v1.30.730, Windows 10 Creators Update (1703) 32bit. When I started the Speccy v.1.30.730 it makes BLUE SCREEN. please solve this problem. It needs Improved Windows 10 Creators Edition (1703) compatibility. please be quick. Same here. Is there any chanche of Piriform adressing this issue? if you have Windows 64bit OS, can you run the 64bit version of Speccy? word today from the Admin team - it is being investigated. @mta I use windows 32bit OS, so I can not test it in 64bit. I wrote it in my first message :"...Windows 10 Creators Update (1703) 32bit." @mta I'm running Windows 10 32bit (build 1703). As a side note, when it still worked, I used to get craxy reading about motherboard temperature (and I stille have with other tools). It works. Still getting crazy motherboard temperatures, though.